What sort of dirty (or not-so-dirty) business has gone into making Zynga's Mafia Wars the kingpin of Facebook? I don't know about you guys, but I steadfastly refuse to get into any of these Facebook games. Any and all requests for me to join my friends in their applications of choice are swiftly ignored, but maybe I'm in the minority here. 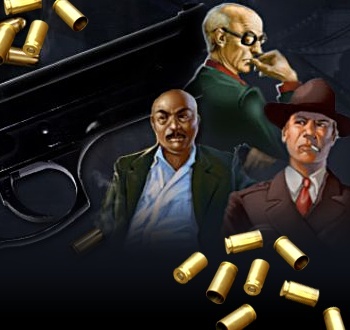 After all, Zynga's Mafia Wars has 26 million users, doesn't it? In Issue 228 of The Escapist, Allen Varney looks at Mafia Wars' nefarious tricks of the trade, and why it has him unable to leave the Family. Unlike real mafioso, Zynga's millions of new players know nothing of their family's long traditions. Though its turn mechanics owe something to old play-by-mail games like It's a Crime, Mafia Wars and other Facebook apps work more like the 1980s BBS door games Pimp Wars, Drugwars/Dope Wars and others. Like them, Mafia Wars is an open-ended, tick-based logistical race. It's asynchronous, meaning you needn't coordinate schedules with friends or opponents. You look in on the game once or a few times a day during dull meetings or conference calls, like checking your email - a few clicks and you're done. It's not brainless, exactly. The design rewards good timing and permits varying strategies (fight, complete jobs, wage war). But compared to the animal street-gang struggles in GTA or Hitman, Mafia Wars is exceptionally forgiving. There's no danger your position will crumble if you leave it for a while, though it takes regular attention to maximize your progress. Which reminds me: I just accumulated 41 Energy and recently got two Speedboats, so now I can Steal an Arms Shipment (a Consigliere-level mission in New York) for 69 experience and $3,390,000. Be right back. To read more about the kind-of-shady dealings of an organized crime simulator, check out "An Offer You Can't Refuse" by Allen Varney in Issue 228 of The Escapist.